Tips to save Photos for web upload without compromise presents you three tricks for Photoshop which can save your high quality photos from going to bad quality. With the explosion of social networks, increasing the speed of the network connection, the devices that connect more easily to the world wide web, all of us, constantly uploading photos on the internet, using the free platforms. Practically no example is required – you know very well, a great quality photograph out of your DSLR plus 35mm Prime combo can turn closer to the quality from an entry level digital camera. If you are not careful to some particular points, it can happen to watch the picture with substantially different colors, with a significant loss of detail or perhaps we will find the presence of some artifacts some what like noise on the photo. The things happens in three directions, thats why three different tips. Since the AdobeRGB color space is much wider and more extensive of the classic sRGB, but it is the only color space recognized by the browser for surfing the net, before saving the image you need to convert the color space; use source (AdobeRGB) to destination as (sRGB). Open the Edit menu -> Convert to Profile to get the options. Other points on showing right colors has been said before. If we upload photos on social platforms, such as Pinterest, Facebook and the like them, our photo will undergo a re-compression both in terms of the size in KB that, in many cases, the size in pixels – this re-compression will generate a lowering of overall sharpness of the image. So we need to adjust that lost sharpness by adding more sharpness. That can be done using High Pass Filter. When an image ends up on the web, means it will be displayed on a device that can surf the net. The images are intended to be small. There is no meaning of uploading a bigger sized image. First, resize the image from the Images resize option menu with proper checkboxes checked. Secondly, save it from “Save for Web…” option as png image without transparency. This Article Has Been Shared 1981 Times! Tips To Take Good Pictures With Your Digital Camera are for those of you who want tips and tricks to take beautiful photographs out of your Digital Camera. Photography Books, Magazines and Forums we have reviewed or read so far, has been listed and divided in to sections without any affiliate or tracking link. 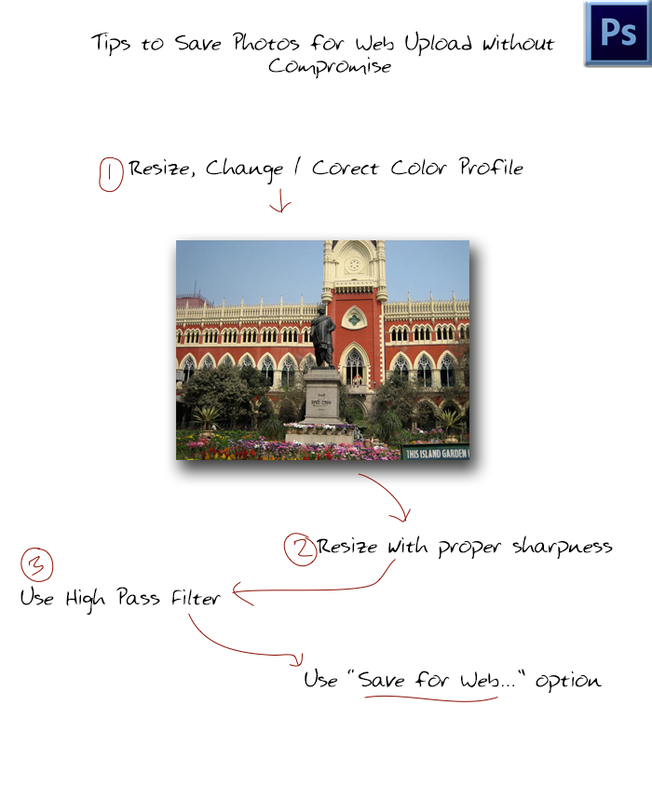 Cite this article as: Abhishek Ghosh, "Tips to Save Photos for Web Upload without Compromise," in The Customize Windows, June 24, 2013, April 23, 2019, https://thecustomizewindows.com/2013/06/tips-to-save-photos-for-web-upload-without-compromise/.